One of the most common questions I had following my original blog post was “can you talk more about the journals?” I want to focus on my happiness journal a little more because I think it’s a fantastic way for people with anxiety to help calm themselves down, especially before bed. First off – some backstory on the journal itself. I came across the idea on Lifehacker and immediately loved it. It’s a simple daily task where you stop at the end of each day and write down three positive things. This can be anything that made you smile, laugh or boosted your mood. I’ve written down everything from “eating chocolates on the couch” to “completing my first Half Marathon”. It can be the big moments in your day, or the little moments. Often times I have trouble deciding which three things I want to write about! And yes, I do have days where I struggle to think of three things that made me happy. Sometimes, bad days just happen. But what it does help teach you is you should take time each day to actually think about your experiences, and think about the good things in your day. I also love going back and reading good things that happened to me months ago. This comes in handy for those bad days I referenced earlier. It helps remind you that despite today being crap, tomorrow could be amazing. It sounds so cliche but it’s true. I also highly recommend doing this at night because as many anxiety sufferers will tell you, your mind can often race the most when you’re just about to close your eyes. You’re totally exhausted physically, but your mind wants to run a marathon. And it’s awful. It’s also not productive, because I don’t know about you but often the stuff I think about before falling asleep is long forgotten by the time I wake up. Or I sit there and imagine horrible scenarios that could happen (often, it’s thinking about whether tonight is the night I die in my sleep). Of course I wake up and feel stupid for even thinking something bad would happen to me while I slept. So keeping the journal changes your focus, and gets your brain in a better place before crawling into bed. It’s easier to shut out the anxiety when you can counter it with “but yeah, remember how much fun I had at work today… it was so funny when…” and before you know it, you’re asleep. So, those little moments. Doesn’t anxiety love to steal those little moments? Anxiety, to me, is all about focusing on the little things and blowing them out of proportion. If you’re like me, it’s getting a headache and believing it to be THAT headache that lands you in the ER. You often aren’t sitting there worrying about big problems. I rarely sit and ponder the plight of poverty in this country, but it should consume me more often because quite frankly it is a subject worth caring about. Wondering whether I’ve annoyed my boyfriend because I sent three texts in a row, isn’t worth my time. But anxiety doesn’t think that way. It wants you to sit there and torture yourself over the tiniest details. The journal is your way to take that and throw it back in anxiety’s face. I’ve always been someone who gets excited about the smallest things. Literally. I follow a hedgehog on Instagram because he is ridiculously cute and always makes me smile. If I were a cat, I’d be more excited for the box than the toy. This journal is the perfect way to remind myself to keep that part of me alive and vibrant. That should be the part of my personality that shines through on a regular basis. I found myself appreciating those little moments this weekend. I had a bad day on Friday but found happiness in sitting on my boyfriend’s couch, sipping a chai tea latte, and listening to some good music. On Sunday we gathered our friends together to watch the Super Bowl, but one of my favourite parts of the day was baking my sugar cookies (pictured above). 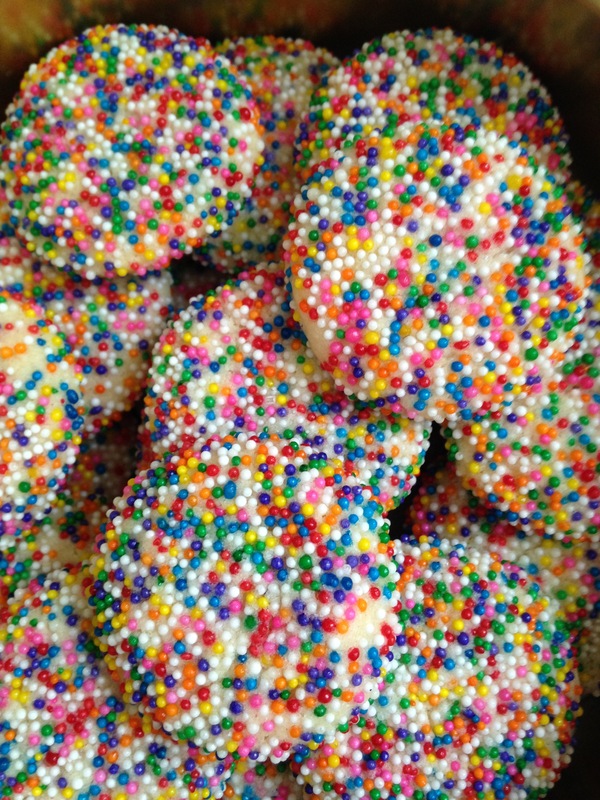 I love to bake, and I love sprinkles, so getting to combine those two things was a fantastic way to spend a Sunday afternoon. As always you can follow me on Twitter for more info or write in the comments.